The rallying cry of fans of the TV series, Community was “Six seasons and a movie.” While playing to an established fan-base is a wise move for movie producers, sometimes striking a nostalgic chord with audiences is the better path to success. Sure, there have been plenty of movies based on TV shows which have also featured the original cast, but sometimes a reinterpretation with modern actors gives the concept a fresh feel. That’s not to say movies based off of TV shows that feature the original cast (a la the Star Trek films before 2009) are wrong, it’s just that a unique take on the themes and motifs of the TV show makes the movie feel more like a standalone story, instead of just an extended TV episode. This week’s two films were based on television shows but did not feature the shows’ original cast. Clearly, the wave of nostalgia for those people who grew up in the 1960s and 1970s is what has inundated Hollywood with the plethora of TV show adaptations. Starting around 2004, the trend to bring these television shows from the golden era of television has only continued. Films like Starsky & Hutch (2004), Bewitched (2005), and The Dukes of Hazzard (2005) all played as standard comedies, albeit updated to the comedic styles and tastes of the new millennium. A couple of years later, we saw these adaptations gain steam again with such films as Get Smart (2008), Land of the Lost (2009), and Dark Shadows (2012) leading the pack. Of course, none of these films were that great. Occasionally audiences would get a treat with such fantastic films like The Man from U.N.C.L.E. (2015), but these were rare. Most films were campy throwbacks, much like The A-Team (2010). 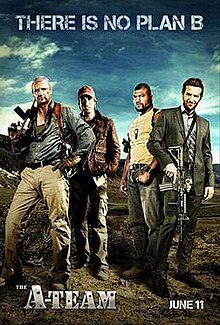 Acting as an origin story for the eponymous “A-Team,” this film modernizes the original premise behind the television show. “In 1972, a crack commando unit was sent to prison by a military court for a crime they didn’t commit. These men promptly escaped from a maximum-security stockade to the Los Angeles underground. Today, still wanted by the government, they survive as soldiers of fortune. If you have a problem, if no one else can help, and if you can find them, maybe you can hire… the A-Team.” Instead of taking place in 1972, these commandos were shown to be Army Ranger veterans from the Iraq war. Upon being framed for a botched mission involving U.S. Treasury plates, these four men set about to find the man behind their wrongful incarceration and manage to bring him to justice. Even before Hollywood began marketing on the nostalgia of comedic television shows, they had already adapted a few films to prove that the concept worked. What’s interesting about these earlier adaptations from TV was that they were almost able to maintain their own notoriety apart from the source material on which they were based. Films like The Fugitive (1993) earned Oscar nominations for Best Picture, whereas Mission: Impossible (1996) spawned a five-film franchise. Even newer adaptations like Star Trek (2009) have been able to cash in on the popularity of its fan-base, even if most of them don’t particularly care to be pandered to. Of course, there are also the television shows that haven’t remained nearly as relevant in popular culture, so few modern moviegoers will know that these films were even based on TV shows. One such film that would fit this category for me would be Maverick (1994). Bret Maverick (Mel Gibson) is confident he is the best card player in the world, so to have definitive proof of this, he enters a poker tournament that requires $25,000 as an entry fee. While he’s a little short on the money, he sets out to get the rest of it from some of his contacts. Along the way, he meets two others who want to participate in the tournament: Annabelle Bransford (Jodie Foster) and Angel (Alfred Molina). Bransford and Maverick manage to con a Russian Grand Duke out of some money so they can both enter the tournament, while Angel is on a mission to stop Maverick from playing. Meanwhile, Marshal Zane Cooper (James Garner, who also played Bret Maverick in the original show) is keeping an eye on all the players, hoping to arrest some of them for illegal activities. The tournament comes down to a single card to determine who will win. So, who has luck on their side? tagged as Based on TV, Bewitched, Dark Shadows, Get Smart, Land of the Lost, Maverick, Mission Impossible, Star Trek, Starsky & Hutch, The A-Team, The Dukes of Hazard, The Dukes of Hazzard, The Futigive, The Man from U.N.C.L.E.